Evan Lewandowski believes Utah is the next great wine region. Is he right? Evan Lewandowski is a really likable guy making really likable wine. He hails from Wichita, Kansas. He’s in his early thirties. He’s what most would call religious, but he uses the word "spiritual." He resides in Salt Lake City, Utah, where he moved to attend the University of Utah in 2001, not so much to go to college, but to ski. He probably wouldn’t have ended up in Utah if the Winter Olympics hadn’t been scheduled there for 2002, alerting his high school guidance counselor to the city’s existence. He applied and was accepted without even visiting the campus. Fifteen years after college, he’s still in Utah, making wine in a tiny urban winery. He estimates that 99.2% of the wine he produces is made from grapes he harvests in California. After every harvest, he leads a small caravan containing the pressed juice and grapes across Nevada back to Salt Lake City to finish. Despite this, he won’t move to California to make wine. This is strictly because he loves Utah so much. If all goes accordingly, he’ll plant his own vineyard there in the spring of 2017. He has big plans for Utah wine. The name of Evan’s winery project is Ruth Lewandowski Wines. That is, you can’t go to Ruth Lewandowski’s house and ask to speak with her. Ruth Lewandowski is a figment of Evan Lewandowski’s reality – reality, not imagination. He chose the name “Ruth” from the Old Testament’s Book of Ruth, a section of the Bible largely concerned with what Evan refers to as “the ripple effect of death on all of our lives.” It’s a book about death, but Evan doesn’t see it that way. To him, “it’s what the Bible is trying to get at the whole time. It’s the cycle of death that pushes life forward.” Using the same logic, Ruth Lewandowski is a dichotomy. It’s the friction between what is understood to be true and what is real. In many ways, Ruth Lewandowski encapsulates Evan Lewandowski’s interaction with the world around him. It’s a simultaneous act of surrender and defiance. It’s maybe a little heavy on the defiance. To make wine in Utah could be considered, in the US domestic wine world, a Sisyphean endeavor. Leaving aside the relative isolation, local social mores surrounding alcohol consumption and the state’s historically chilly liquor laws, the majestic plains of the great Beehive State are not exactly what one pictures when considering a vineyard site. Napa Valley this is not; in general, it gets dry, it gets cold, and it stays cold. Usually, when we don’t understand something, we try to foist some kind of meaning on it. When we don’t understand why a person does something against all apparent reason, we call them crazy. Evan Lewandowski is not crazy. So why is he trying to make wine in Utah? As it turns out, Evan also knows more about viticulture than most wine professionals you encounter. He attended the Walla Walla Institute for Viticulture and Oenology, and while it’s not abnormal for a winemaker to know a lot about what they do, Evan talks about Utah’s soil and climate with the confidence of a guy who knows he’s staring at a stacked deck when everyone else is late to the table. “You can say, ‘It’s the soil and climate.’ That’s why a winegrower chooses anything,” he says. “But for me, it’s more than just soil and climate. 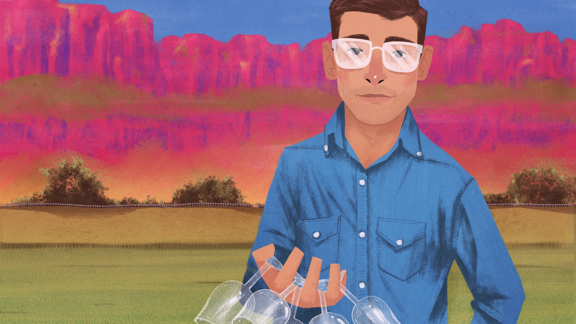 There’s soil and climate all over the world.” Utah, he insists, is on another level. Lewandowski knows this because he’s made wine all over the world. Over the course of six years, he worked in Australia, Napa, Alto Adige, Montalcino, and Argentina. Everywhere he went, the plan was always to work, glean something new, and get back to Utah. Most recently, he was in Alsace, where he worked with Christian Binner, one of the most respected producers in the region. “[Binner] prunes really differently than a lot of other people,” he says. “I wanted to know why and how, and what the benefits were.” Binner offered Evan a job – and rescinded it less than twenty-four hours later. Christian Binner isn’t the only one who doesn’t think Evan is crazy. Zev Rovine of ZRS Wines – largely understood to be one of the most forward-thinking import and distribution portfolios in the US – represents Ruth Lewandowski. It’s a relationship that’s come full circle: Zev first met Evan when he applied for a job at The Spotted Frog, the Salt Lake City wine bar Zev happened to run when Evan was in college. Evan was under 21 at the time, so he didn’t get the job, but Rovine hooked him up with an international winemaking internship program to get him going. Evan knows what kind of wine he wants to make: the kind that comes from Boulder, Utah, a town with a population of 222, four hours south of Salt Lake City. This is where he plans to start his first vineyard next year. When you ask Evan what it is about a place that looks more or less like a scene from a Roadrunner cartoon, he lets out a low, guttural growl. It sounds vaguely carnal. It’s oddly enthralling to hear Evan describe the geology of an unknown place in the middle of nowhere. His earnest enthusiasm for the natural composition of the land is charming. Utah’s Tourism Board would be smart to employ his ardor. Before long, it’s clear that it’s not the cold vagaries of soil composition that drives his intense affinity for Boulder, or for Utah, or for winemaking. And although Evan admits that there are disadvantages to being a lone ranger in unknown territory, it’s clear that he thrives a bit on the adversity. He says outright that he feeds on pressure, that he loves a challenge. The role of the maverick underdog is one that suits him well, and whether he’s conscious of it or not, it’s a mindset that seems to find its way into many of his decisions, be it deciding to attend a college in a place he’d never visited or choosing which grapes to plant when his Boulder vineyard is ready in spring of 2017. “Riesling, grüner, kerner, zweigelt, côt – cooler climate, leaner, shorter season varieties.” He stops for a moment. “I could jump on the trousseau wagon if I really wanted to, but there’s a part of me that says ‘You can’t do trousseau now, because everyone’s already on it.’ But, it would be really good there.” He’s right; trousseau’s affinity for high elevation and cold make it an ideal candidate for Utah’s uncharted climes. But ideal is obviously not Evan’s style. Still, after all of the technical, philosophical, spiritual and personal devotion to Utah, there might be a rift in the reasoning: Evan’s singular attempt at making wine from Utah grapes – Riesling he purchased from neighbors – is still in barrel, and his Boulder vineyard has yet to be planted. In the most real of realities, Evan has never made a wine from Utah. Rovine, who is responsible for explaining this sort of thing to the likes of Patrick Cappiello, who features Ruth Lewandowski wines at Pearl & Ash in New York, shrugs it off. “I don’t have a philosophical issue with moving juice or grapes,” he says. “It’s not that different than moving bottles.” To him, Evan’s goal – to discover new domestic terroir, plant the right grapes in the right place, change our understanding of what is actually possible – outweigh the naysaying. What does Evan Lewandowski say? Why doesn’t he do what he’s doing in California, where the process would be holistic, beginning to end? The powerhouse chef on her new memoir, identity, and controlling destiny (or not).